WASHINGTON — Arianespace said Oct. 11 it’s too soon to say whether the Soyuz-ST rockets it uses to launch satellites from South America will be grounded following the failure of a Russian Soyuz-FG rocket carrying crew to the International Space Station. Preparations for Arianespace’s planned November launch of a Soyuz-ST rocket carrying a European weather satellite remained underway Oct. 11 at Europe’s spaceport in French Guiana despite a still-unexplained Soyuz booster failure earlier the same day that forced the Soyuz-MS10 spacecraft to abort its mission about two minutes after liftoff and make an emergency landing. The payload for the November mission is Metop-C, a weather satellite built by Airbus Defence and Space for Europe’s Eumetsat meteorological organization. The launch is scheduled for Nov. 7, according to a recent Eumetsat update. Arianespace also noted in its statement that it uses a variant of the Soyuz rocket Russia uses to launch Soyuz TMA-M capsules to the space station. “The versions of this launcher used for Arianespace flights from the Guiana Space Center in French Guiana are ST versions, which are different from the FG version used for this mission to the ISS,” Arianespace said in the statement. While both rockets are Russian, the Soyuz variant that Arianespace uses is slightly newer and incorporates changes such as a larger fairing, a new digital telemetry system and some engine modifications necessary for launching in high humidity. Arianespace did not operate the Oct. 11 launch and does not conduct human spaceflight missions. 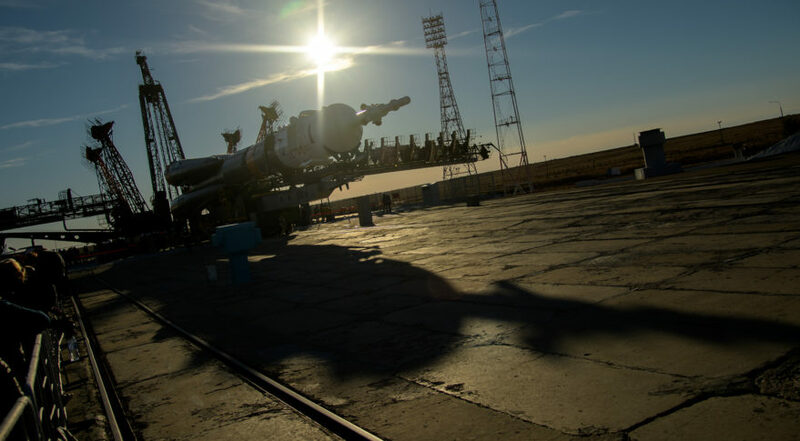 The crewed Soyuz vehicle with NASA astronaut Nick Hague and Roscosmos cosmonaut Aleksey Ovchinin returned to Earth safely after the Soyuz rocket booster malfunctioned. Roscosmos has set up a “state commission” to investigate the anomaly. Arianespace has been launching Soyuz rockets for companies and government agencies since 2011, operating the Russian vehicles from Guiana Space Centre, the same spaceport used to launch European Ariane 5 and Vega rockets. Russian crewed missions take place from the Baikonur Cosmodrome in Kazakhstan. Eumetsat’s Metop-C weather satellite is designed to measure temperature, humidity and wind, as well as to detect ozone and other atmospheric gases. Eumetsat has two second-generation MetOp satellites, Metop-SG A1 and Metop-SG B1, also slated to launch on Soyuz rockets between 2021 and 2023. Four additional Arianespace customers — OneWeb, based in Britain’s Channel Islands, telecom satellite operator SES of Luxembourg, and the Italian and European space agencies — all have Soyuz missions scheduled for this year or next year. OneWeb’s debut launch of 10 small telecom satellites, planned for sometime between December and February. The launch is the first of 21 Soyuz missions OneWeb purchased from Arianespace to carry between 690 and 720 satellites to low Earth orbit. OneWeb envisions a fast-paced launch campaign for the subsequent 20 missions, each carrying 34 to 36 spacecraft. SES’s final first-generation launch of four O3b satellites, planned for 2019. All 16 O3b satellites in medium Earth orbit today launched on Soyuz rockets four at a time. SES has not announced a launch provider for the second-generation fleet, called O3b mPower, which Boeing is building, but said last year that the satellites were also designed to launch four at a time like the first generation from Thales Alenia Space. The 2019 dual launch of the European Space Agency’s CHEOPS (Characterizing ExOPlanet Satellite) and the Italian Space Agency’s Cosmo-Skymed radar satellite. The civil- and military-purposed Cosmo-Skymed satellite has a similar polar, sun-synchronous orbit to CHEOPS, enabling the shared launch. Airbus is CHEOPS’ manufacturer, while Thales Alenia Space is in charge of building Cosmo-Skymed. Soyuz is Arianespace’s medium-lift launcher, filling the gap between the light-lift Vega rocket and the heavyweight Ariane 5. Last year Arianespace used Soyuz for two missions to geostationary transfer orbit — the drop of point for most multi-ton telecom satellites — a feat championed as evidence of the rocket’s versatility. Before then, Arianespace-operated Soyuz launches were all to lower orbits, many to medium Earth orbit for the European Commission’s Galileo navigation satellites and for SES’s O3b telecom fleet. Eumetsat and the Italian Space Agency did not respond to requests for comment. OneWeb declined to comment. SES said it is not expecting an impact on its launch schedule due to the difference on Soyuz variants. “Most important – the crew (Nick Hague, NASA, Aleksey Ovchinin, Roscosmos) is safe and in good condition. The aborted launch will have influence on the planning for the near future of ISS and the Horizons mission of ESA astronaut Alexander Gerst. We can’t provide further comments on this right now. “A commission is put in place by Russian space agency Roscosmos. All other International Space Station partners, including ESA, are in full support of the ongoing efforts by the Roscosmos commission. ESA Director General Jan Woerner sent an email Oct. 11 to the head of Roscosmos, Dmitry Rogozin, offering ESA’s assistance in the Soyuz anomaly investigation. Glavkosmos, the Russian company that since 2017 has also marketed Soyuz missions, but mainly for cubesat and other small satellite missions, also did not respond to a request for comment.